Some plants are at their showiest in winter. Coralberry (Symphoricarpos orbiculatus), also called Indian Currant, is one of them. 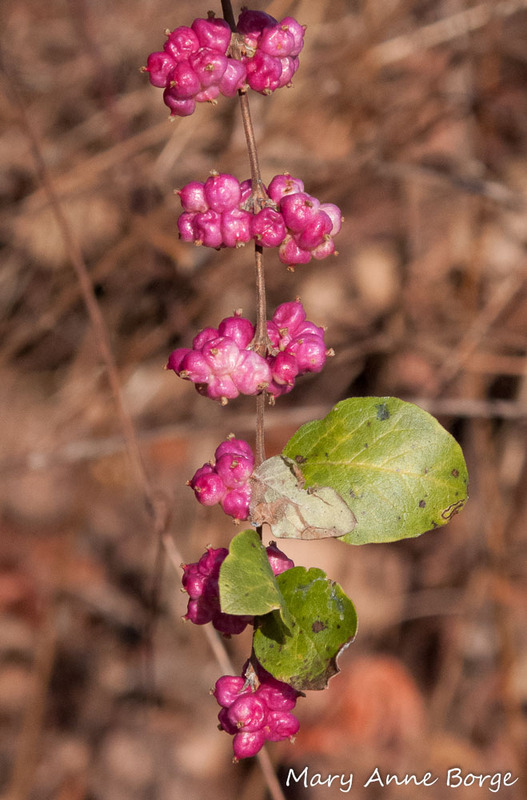 Named for its fruit, Coralberry’s bright clusters of purplish to coral colored berry-like drupes persist on this shrub’s otherwise bare branches throughout much of the winter. Drupes are fleshy fruits with seeds inside in a stony enclosure, like a peach. Some plants have evolved to have their fruit be at its most appealing to their target seed dispersers (usually birds and some mammals) in late winter, when there is less food available. This strategy works well for the plants, since there is less competition from other food sources. It works for the animals, too, since it means they will have something to eat throughout the cold weather, tiding them over until the growing season begins. 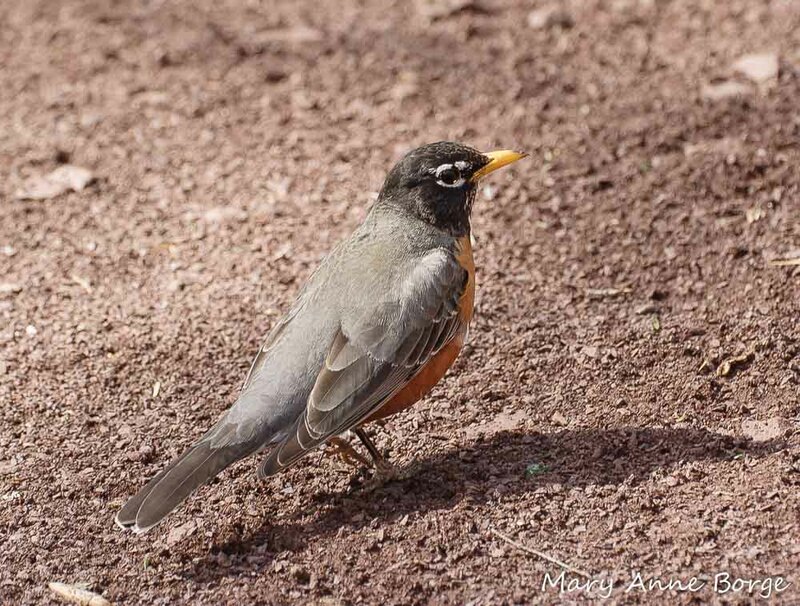 Robins and Bobwhites are among the birds that consume Coralberry’s fruit. From a human perspective, Coralberry’s fruit is not really recommended for consumption. It contains saponins, which give the fleshy fruit a bitter taste, and in sufficient (really large) quantities can be toxic. Saponins have antimicrobial and antifungal properties, in addition to some other potential medicinal applications. They likely help to protect the plant from invaders. Some Native American tribes made a decoction from the inner bark or leaves to use as a wash for weak, sore or inflamed eyes. Coralberry grows to a maximum height of about 4 – 6 feet (1 – 2 meters) with gracefully arching branches. Its opposite leaves are typical of the Honeysuckle (Caprifoliaceae) family, of which Coralberry is a member. You could walk past this shrub while it’s in bloom and never notice the flowers. They are small, bell-shaped, whitish, and completely concealed from above by leaves. Fortunately, the bees, wasps and flies that are their likely pollinators are able to find them. It flowers in mid-summer, usually July in the mid-Atlantic region. 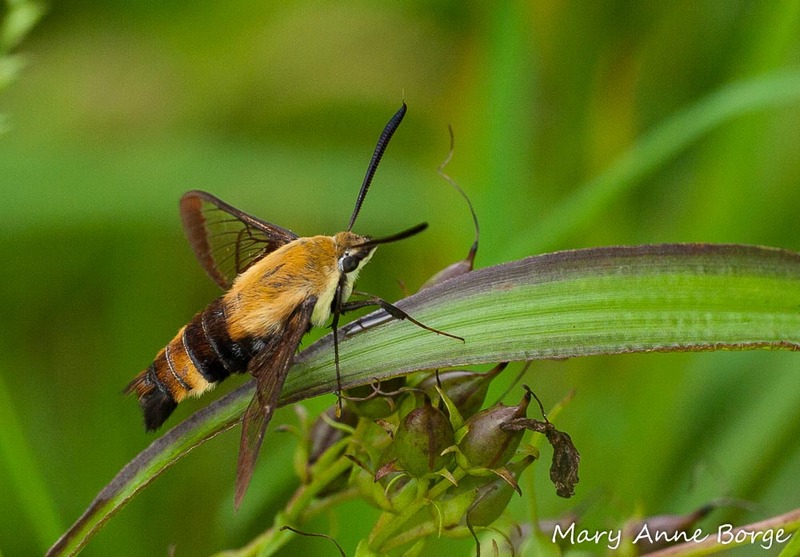 A day-flying moth, the Snowberry Clearwing (Hemaris diffinis), has evolved to rely primarily on Coralberry and other members of the Honeysuckle family as food for its caterpillars, although they can also consume Dogbane (Apocynum species) leaves. Snowberry Clearwings are named for their dependence on Coralberry and the closely related Snowberries (Symphoricarpos species) as caterpillar food plants. The Snowberries’ clusters of fruit are white, giving them their name. The Hummingbird Clearwing (Hemaris thysbe) moth, another day-flier, also uses Symphoricarpos species, possibly including Coralberries, as food for its caterpillars. 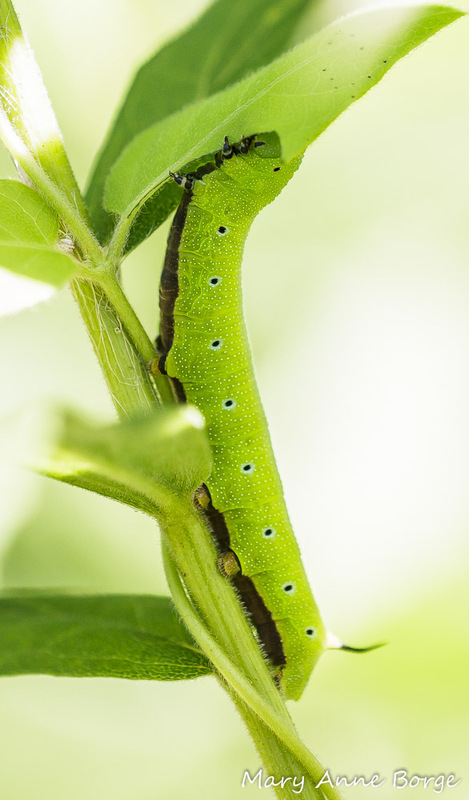 The Hummingbird Clearwing’s caterpillars have a somewhat broader palate, including hawthorns, cherries, plums and some viburnums in addition to the Snowberries. Coralberry tolerates a wide range of soils, and grows in light conditions from partial shade to full sun. It reproduces through seed dispersal, with the assistance of birds or other animals that eat its fruit, and also through stolons, above ground runners that root where they touch the soil. Its native range is primarily the eastern two-thirds of the United States, and parts of Utah. It has also been introduced in Ontario province. 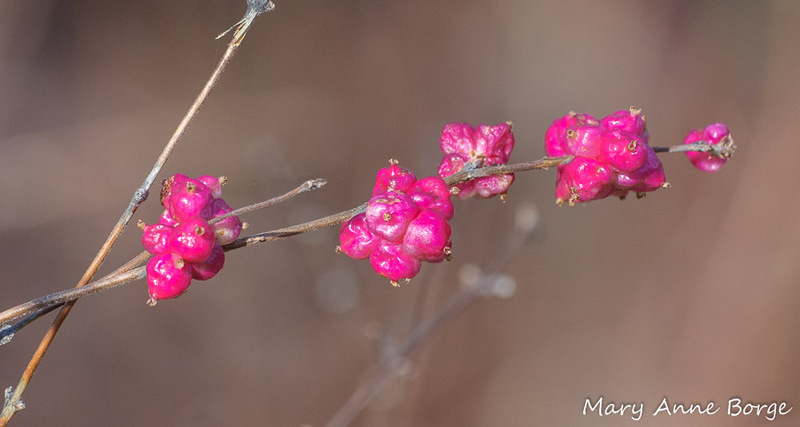 Winter is the time of year that Coralberry demands your attention. Look for its bright fruit along woodland edges and in open meadows. Beadle, David; Leckie, Seabrooke. Peterson Field Guide to Moths of Northeastern North America. 2012. 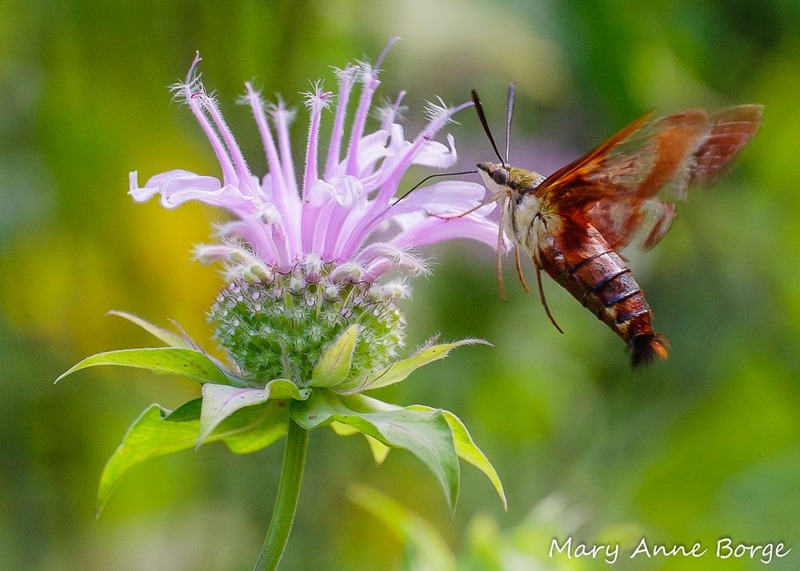 This entry was posted in Birds, Gardening for Wildlife, Medicinal Plants, Native Plants, Nature, Other Insects and Spiders and tagged Coralberry, Hemaris diffinis, Indian Currant, Snowberry Clearwing Moth, Symphoricarpos orbiculatus by Mary Anne Borge. Bookmark the permalink. You should be able to find Wild Bergamot in many places, including the Wildflower Preserve. If you have to look for it someplace other than the Preserve, be sure to ask for it by it’s scientific name, Monarda fistulosa, to be sure you get the plant you want. If you have trouble locating it let me know.